Big shout our to my mom - today is her birthday so Happy Birthday mom! She is indeed my biggest blog-fan. And I'm so very proud of her the past few months she has transitioned her diet into "almost vegan." Soy milk, tofu, low oil, lots produce and other vegan goodies in her diet have helped her lose about 15 lbs - as well as increase her HDL and lower her LDL cholesterol. I love vegan success stories. And I'm especially proud of people who embrace vegan foods later in life. It can be hard to break habits that you have kept your entire life. So bravo mom! And Happy Healthy Birthday!! Creamy rice porridge infused with vanilla, pumpkin, spice and maple. This creamy, hearty bowl is delicious for a sweetly-kissed breakfast or hearty dessert. Oh, maybe a side scoop of vanilla soy or coconut cream over top the steaming hot rice - yum dessert.. This is my new have soup recipe. I love it. White beans, vegan buttery mashed potato a few veggies and a nice burst of .. hot sauce! This is a recipe with a try history in the USA. The US Senate serves it at lunch every single day! So I decided to help them out with a delicious vegan version. Easy and delicious. Healthy too. Protein and fiber packed. 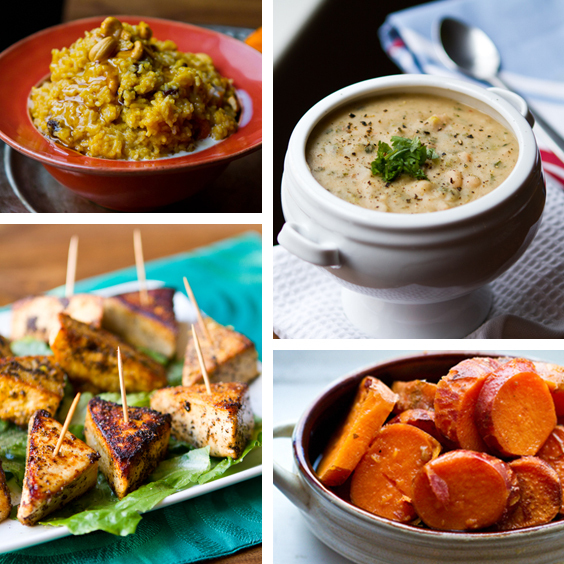 Need a little help throwing together a vegan feast this year? From stuffing and cranberry sauce to sweet potatoes and dessert - these 15 recipes will have you well on your way to a wonderful holiday! Delicious for you, happy for those sweet, fluffy-feathered turkeys. Turkey kisses to all! These crispy, delightful little tofu triangles will have you ... craving tofu! Can you just imagine the dipping sauce possibilities?? Easy recipe that's a great party app! Start your busy holiday mornings off right with some serious vegan fuel. Pumpkin, spice, maple, pomegranate and more flavors of fall and winter ahead! Easy, delicious sweet potatoes - worthy of the snazziest holiday feast table.